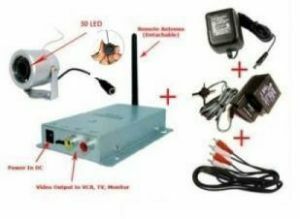 worlds smallest cctv wireless camera is unique economical solution for home s/shop/office surveillance , This hidden security camera can show live video footage on TV LCD . There is no physical connection between camera & receiver unit . camera video is color with minor deteriorate audio ( this product do not has feature of any inbuilt recording & only third party video capture device like dvr, vcr, ETC can be used for recording purpose. 1X Worlds Smallest Wireless 30 Led Cctv Camera With Power Adapter & AV Cable .